Businesses that measure their emissions have the opportunity to make informed decisions that lead to improved efficiency and reduced emissions. The practical applicability of the GLEC Framework to complex multi-modal settings was tested by companies as part of the LEARN project. Download a summary here. The full report will be available in March 2019. Following the development of research questions and testing methods, companies were invited to participate, supported by different LEARN consortium partners. The 30 companies that completed the testing represented shippers from various industry sectors, logistics service providers, carriers and operators of different sizes. They jointly covered all transport modes and different logistics sites in Europe and other parts of the world. 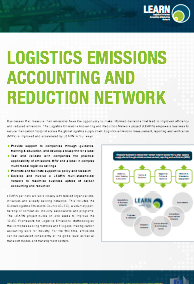 To ensure broad validity of results, the tests included companies with limited and advanced carbon accounting experience, in-house and external tools, and own and subcontracted fleets and logistics services. Feedback was obtained from through questionnaires and analyzed by industry and accounting experts.